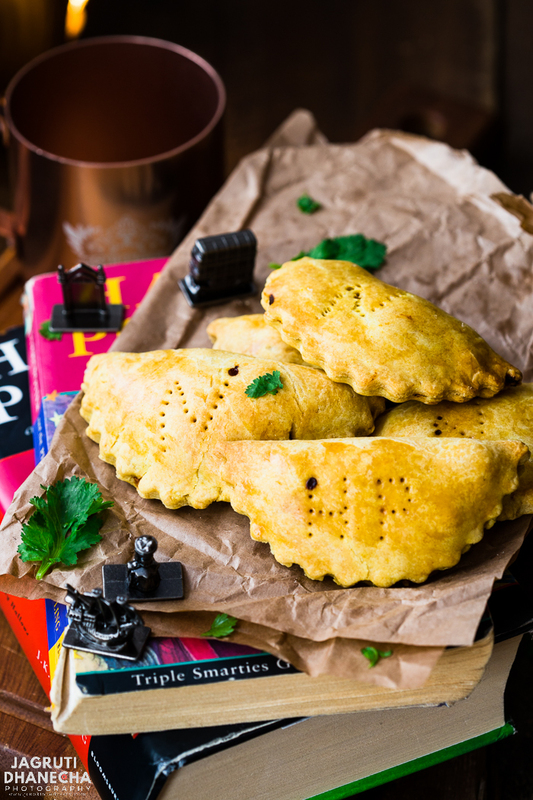 Relive the magic with these Harry Potter inspired vegan pumpkin pasties. Perfect for your next Harry Potter movie marathon or Halloween parties! The books and movies may have ended years ago, but Harry Potter magic very much still lives on in our hearts. In a way, it feels like it never truly ended with tonnes of Harry Potter related goodness continually being released. Back in 2016, I saw Harry Potter and the Cursed Child in London. I remember the exact day the tickets were going to be released. I was at university and my parents were back home and we were all on the ticketing website waiting with baited breath. There were over 8,000 people in the queue ahead of me! You can imagine my relief when my mum called me saying that she'd managed to get hold of a pair. I also love to see the different locations where the movies were filmed - Leadenhall market, Lackock, Bleinham Palace to name a few. When I visited Edinburgh with my friend for New Year's, we popped into the Elephant House - the coffee shop where JK Rowling wrote her early novels in the back room. I am looking forward to seeing the Harry Potter in Concert in Royal Albert Hall next month. Luckily, at the same time, they have an installation of 9 giant wands by St Pauls Cathedral to raise awareness for JK Rowling's charity Lumos. The installation also coincides with the release of the next installation of the Fantastic Beasts movies. As you can probably guess, I'm a huge fan! Even my old school friends associated me with Harry Potter, something we reminisce about to this day. So naturally, my love for the series also echoes in the kitchen! With Autumn very much here, and in honour of my Harry Potter love, it was only fitting to make Pumpkin Pasties. 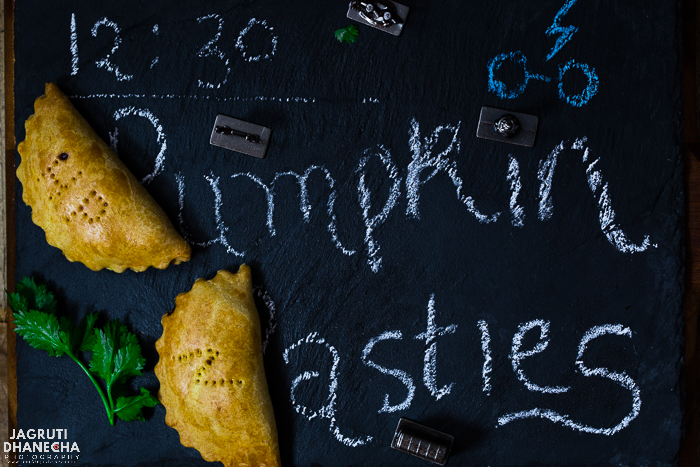 We've made veggie Cornish pasties in the past but never with a pumpkin filling. 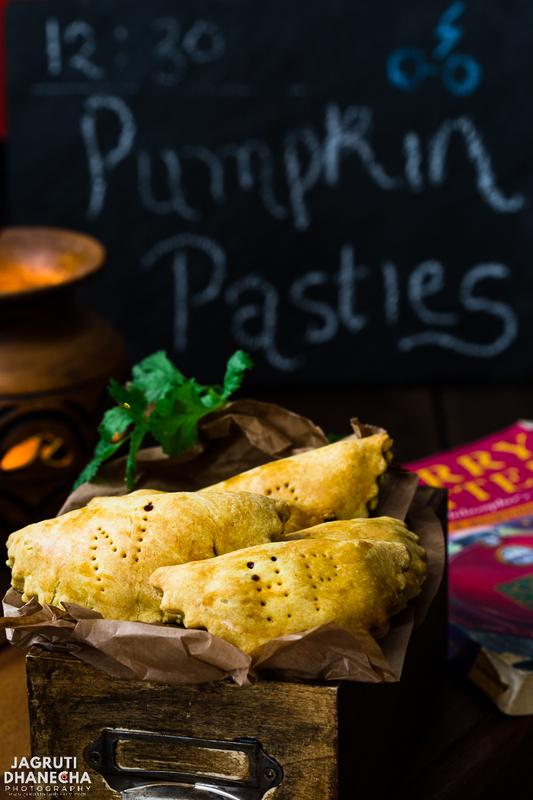 Now I'm not entirely sure if Pumpkin Pasties are meant to be sweet or savoury in the books, I never found a definite answer - so maybe you could let me know in the comments below? Previously, we made Butterbeer, which turned out really really well and very similar to what was served in the theme park in Florida and the Warner Brothers studio in London. So back to the pasties - they were actually pretty simple to make, something that surprised me. You just need to give yourself time with preparation but the process itself isn't too taxing. The filling turned out really well - all of the flavours balanced each other nicely and all encased in a vegan pastry. Molly Weasley would be proud. 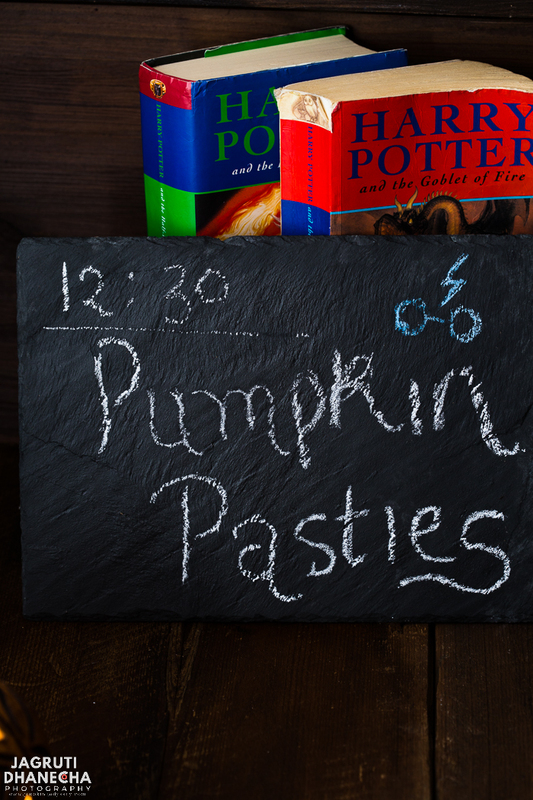 So, get together with all of your fellow Potterheads and make these Pumpkin Pasties - great for your next movie marathon or eat them hot straight from the oven re-reading one of the books whilst the rain is pouring down outside. 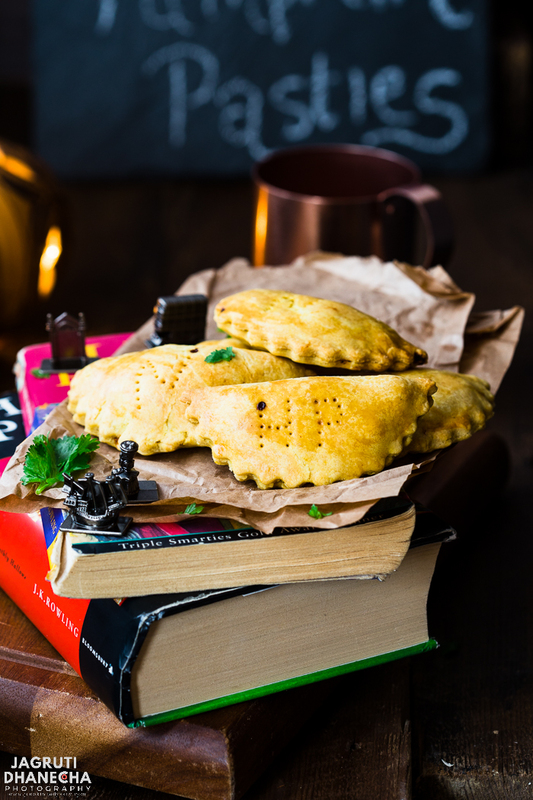 So, here is the recipe for these delicious vegan pumpkin pasties for wizards and muggles alike! 1 tbsp. fresh chopped thyme and parsley. Place flour, salt, sugar, turmeric powder and cubed butter in a food processor and whizz to combine. Add water little by little through the funnel until the crumb starts to come together. Scoop the crumbs into a ball and wrap in cling film and leave it in the fridge for 30 minutes. In a thick bottom pan heat oil and add onion and garlic. Add pumpkin, potato and sweet potatoes and mix well. Cover the pan with the lid and turn the heat low. Cook the mixture until done, if needed add a little water. Add English mustard, black pepper and check the seasoning. Leave it aside and leave it to cool. Take out the pastry from the refrigerator. Preheat the oven to gas mark 6, 200F or 180C. Roll out the pastry on a worktop and using a cookie cutter or small saucer cut out round circles. Place a heaped tablespoon of pumpkin filling on one circle, spreading it slightly, leaving a margin around the edges. Gently fold the pastry over the filling and press the edges to seal. Arrange all the pasties on a baking tray and brush them with the milk. Bake it in the oven for 40-45 minutes or until nice, golden and crispy on the top, brushing little more milk halfway through. 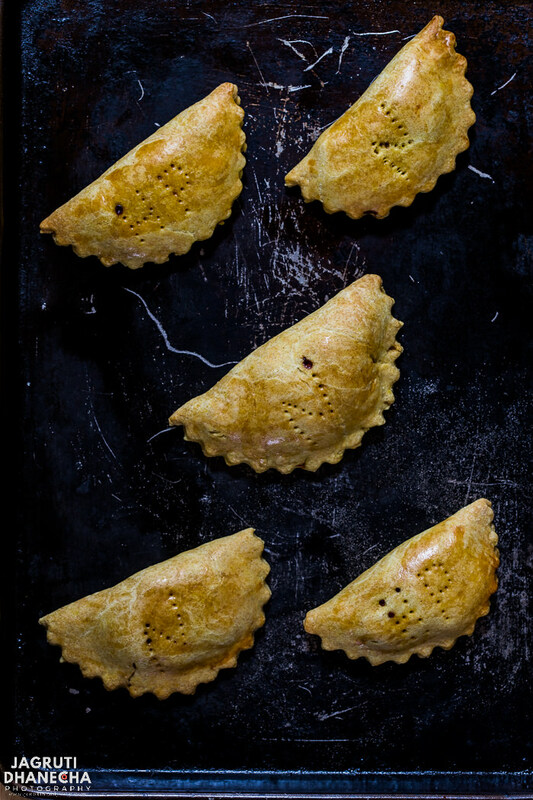 These pasties great on its own or for a meal served with some fresh salad. If you're pressed for time use store-bought pastry. Well I am a Harry Potter fan...so these would be a hit for me too. What a fun recipe. I know my grandson would love them too. Always fun when you can combine a great book/movie with food. What a fun and yummy recipe! my daughter is a huge Harry Potter fan and would love these! Oh i love these baked ones... The filling of pumpkin is bit interesting... Awesome share !!!! I'm a big Harry Potter fan! I've read each book multiple times and enjoy it each and every time! These pumpkin pasties looks delicious!! Lovely write up just loved reading the post and the recipe is to die for , if I show my son these who is a great Harry Potter Fan he will make me bake these asap. ,thanks for the lovely recipe. Yesss!! I love Harry Potter too. And I love the sound of these pumpkin pasties!! Wow, i may sound odd, yep am not a big fan of Harry Potter, and dunno why.. Am sure these patties will become definitely my favourite as i love pumpkin in anything. And those patties looks absolutely gorgeous Jags. I love the way you have ties up two of your favorites in one. Yes adorable harry potter as he begins and transforms into adult hood is just read and re read in my house... so i am sure this recipe will be welcome too. I will let them try it during the fall holidays. My son is a great Harry Potter fan too; has all the books, paraphernalia etc. Are you going for the Harry Potter cruise coming up? My son is so excited but it is from England :( In honor of the fans, I thank you for making these super delicious, awesome looking pumpkin pasties!!! Looks great dear!!! 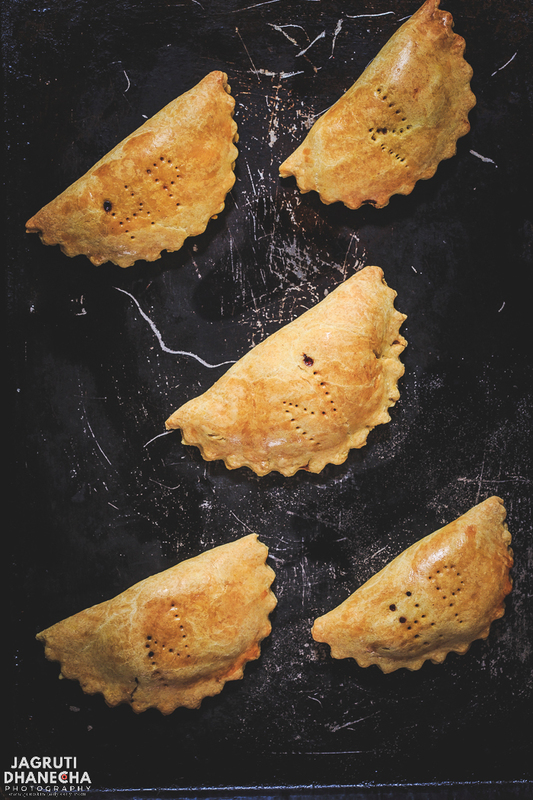 The pasties look so good and perefectly baked Jagruti ! Lovely write-up and Stunning photography as always . Lovely pasties! The filling is perfect for the Fall season too :) Love the composition, how creative! these pasties looking awesome having filling of pumpkin inside. Making a vegan version sounds cool. I have not read any harry potter so can not relate the enthusiasm :). I was a huge fan of Harry Potter once, It's very nostalgic. The pasties are baked to the perfection and I loved the carvings you made on the pasties. Pumpkin and sweet potato are my favorite ones. My heart wants to try this recipe immediately. Great share! Pasties look absolutely delish and gorgeous. Pumpkin filling sounds interesting and a perfect fall recipe and theme. I remember pasties as snacks that we would often have during childhood. 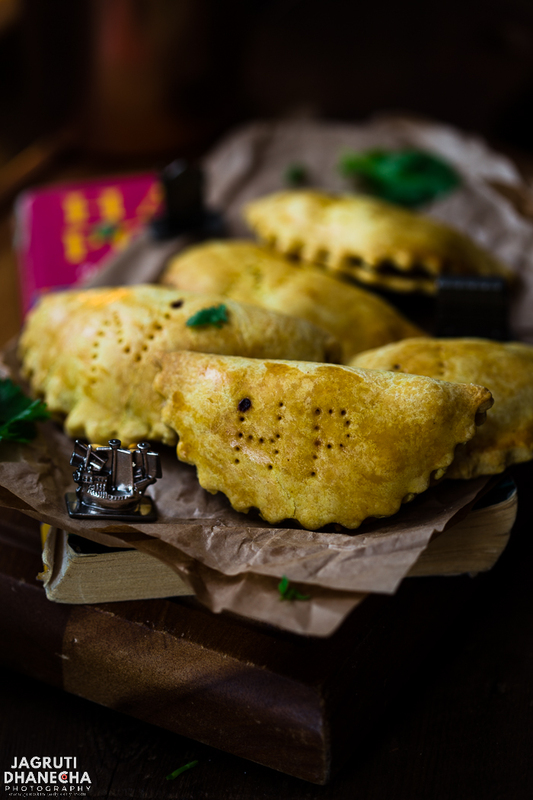 Your pasties look so delish and love the fact that you have used pumpkin here. Love these perfectly based Pasties.Absolutely new recipe for me. Perfect way to use pumpkin in this season. Yum! I made Harry Potter Pumpkin Pasties this year too but they weren't vegan. I love your vegan blend of potatoes, sweet potatoes, onion, and tomatoes. These would be perfect on their own or with a nice bowl of tomato soup. Always glad to meet another Harry Potter fan too! I was able to catch the Cursed Child in NYC this year, but I'd love to go back to London to see it also. I really regret not doing the studio tour when I was in London last year. I am EXTREMELY jealous that you were actually in London when Harry Potter came out!!! I would love to see the places where this movie was made! Huge fan here, as well! These are the cutest pastries!! I'm going to share this with my sister as she is the biggest Harry Potter fan I know! I love these pumpkin pastries. Most son is a huge Harry Potter fan and he is going to love these pastries! They are hearty and easy to prepare/ Great for a party theme too! They're so fun and sounds super tasty. My daughter is a big HP fan and is having her birthday party later this month, so I'm bookmarking these. Well I clearly need to make these for my niece when she spends the night. I will be he best aunt ever! Love the recipe with pumpkin! It looks like it is quite easy to make and it's so tasty! Saving the recipe for later! What a cute idea!! These make me want to throw a Harry Potter party :) Or maybe I'll just make them for myself!! I love that these are Harry Potter inspired! I bet these taste every bit as delicious as these photos make them look. In my mind I always thought of pumpkin pasties as sweet, but you're right - they never specified. I guess it's something else fun that was left up to our imaginations. What a great take on this magical treat! These are perfect for the Harry Potter lover in us all. I will be saving this for later this season when my daughters birthday is near.